It's February - a time for winter fun, lots of love, and of course, chocolate! For winter fun, think about Skiing or Tubing at Roundtop Mountain Resort. We have discount lift tickets for skiing. You save some $$$ at Roundtop and here at the B&B with our (10% off) winter rates. Valentine's Day is the day for romance. Enjoy our luxury suite, Suite Remembrance, with a fireplace and whirlpool tub. Lady Amherst's Library has a sky-light over its whirlpool tub - so you can watch the stars while enjoying the bubbles in the tub. If you think you need a reason to make your reservation, check out this article in USA Today! What better way to celebrate Valentine's Day than with chocolate! Try Helena's Chocolate Cafe & Creperie! This little restaurant is located on West High Street in Carlisle - so it's just one turn from our road. After enjoying your chocolate, go to The Carlisle Theatre for a night of entertainment! 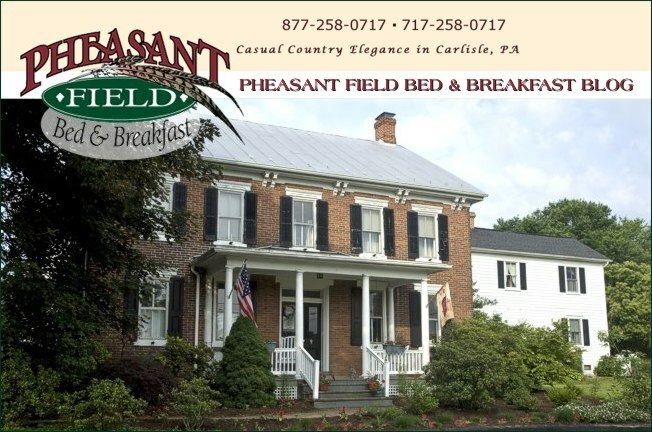 Come to Pheasant Field B&B in Carlisle, PA for a great winter getaway! And don't forget about Georgie Lou's around the corner on N. Pitt from Helena's. We're Carlisle's only full service candy store with everything from Turkish Taffy to truffles! We've got tons of specialty items for Valentine's Day--check us out!